Could this be Winter's last gasp? Well the long range trend suggest mild conditions and above average precipitation chances over the next 8-14 days ahead. Mother Nature though has something different up her sleeve come Monday morning into Monday afternoon. A vigorous little clipper-type system looks to roll out of the Ohio River Valley over the mountains of Maryland and into our neighborhood after the morning rush. The storm system by no means is a big one as it fights to survive it's journey through the leftover dry air mass currently in place. This storm system is one of "TALK" compared to actual impacts. Current timing for precipitation looks to be mid to late morning into the afternoon hours. 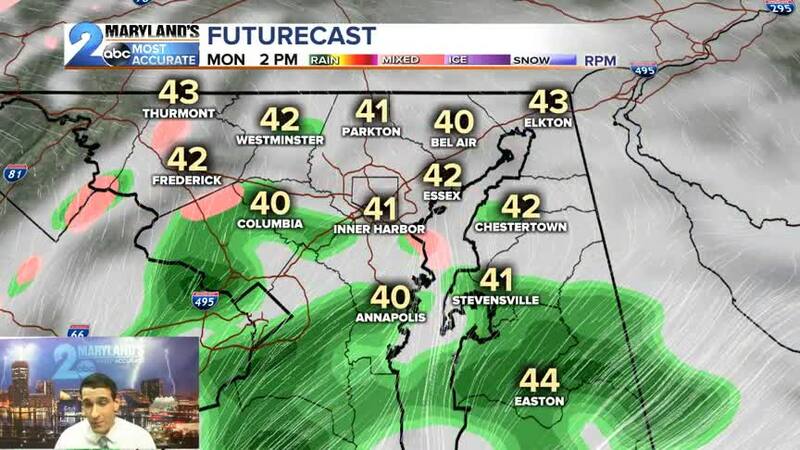 North and west of Baltimore will start with some snow showers while the city points south see mainly rain as temperatures sit above freezing. Some locations may get away "DRY" since precipitation will be in a scattered form fighting the dry air aloft. Energy with our storm system is potent, but once again the "DRY AIR" is the limiting factor for moisture in many locations around our region once the storm arrives. Little to no snow accumulation is expected with maybe a light dusting at best on the grass west of I-81 and out through the mountains of Allegany/Garrett Counties. With the recent warm spell as well and temperatures climbing above freezing we do not look to see any issues on the roads nor the concern for school delays. The storm system exits by early evening with clearing skies across the region. Sunshine will prevail Tuesday and Wednesday with a warming trend as we head off into Spring. Stay tuned for additional update Monday morning as the storm system rolls our way.